My wife Michele makes this great gingerbread cake every Christmas, and in addition to being quite delicious, it's really simple and would be a perfect item to bring to any holiday party. It has a very simple lemon glaze on top, but also works nicely topped with lemon curd, whipped cream, or vanilla ice cream. This has been posted previously, and here is the original post in case you'd like some more information. Enjoy! 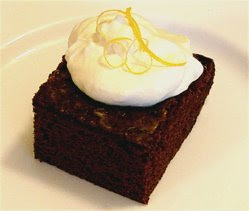 Click here for Gingerbread Cake with Lemon Glaze Recipe. I had no idea what to make for xmas dessert. I think I will try this! This is a great idea and it's simple to prepare too. Never thought of having lemon skin to decorate. Creative one. Now THIS is gingerbread! To everyone watching, make this - you're in for a magnificent holiday treat that's addictive enough to keep the party going and interesting enough to make sure that you're the centre. Somehow, the words "spicy," "sweet," and "festive" don't make this dessert seem appetizing. Forget those words. This gingerbread is good stuff. The perfect holiday party food. I'm going to make this for Christmas, and I think I'll top it with a bit of your (ever-so-slightly-sweetened) crème fraîche! Chef, do you ever use the giant carbon steel chef's knife we occasionally see in the background on your videos? If so, what is your method of cleaning it? Mine all turn orange :(. Nice to contact you!!!!! How are you doing??? I'm all the way far from you and your gorgeous cousine - just in Brazil! My name is Adriana, i'm 22 years old, and I recent found out your website when I looked for a good recp. of onion rings - which we usually don't eat in Brazil, and I found the perfect one! So I started to follow your cooking skills and I would like to congrat you for being a very nice and outgoing chef! Your cooking is amazing! I figured that you don't have banana cake rcep, so how would you like receiving a video from a brazilian related to an awesome and easy banana cake? thanks! i'd love to see it! I'd forgotten how good gingerbread and lemon are together. Could I use treacle instead of molasses? I used to add a pinch of ground chili powder for added zing. Happy Christmas Chef John, or should I say happy holidays - whatever is good for you! Thanks! I've never used (or tasted) treacle! All right!!!! That is going to be fun!!!! Can I have an e-mail to send you the video? talk to you soon Chef John! Ginger bread came out great. I made two changed to the recipie. Used 1.5 tablespoons grated ginger instead of ginger power and 1/4th cup eggbeaters instead of egg. The lemon glaze was "the icing" on the cake, literally. It was an instant hit at my home. Tasted great with vanilla ice cream. Thanks for posting the recipie.